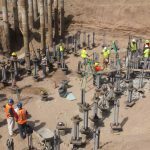 Also called caissons, drilled shafts, drilled piers, Cast-in-drilled-hole piles (CIDH piles) or Cast-in-Situ piles, a borehole is drilled into the ground, then concrete (and often some sort of reinforcing) is placed into the borehole to form the pile. 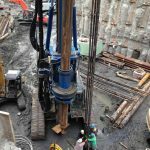 Rotary boring techniques allow larger diameter piles than any other piling method and permit pile construction through particularly dense or hard strata. 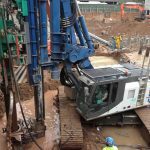 Construction methods depend on the geology of the site; in particular, whether boring is to be undertaken in ‘dry’ ground conditions or through water-saturated strata – i.e. ‘wet boring’. 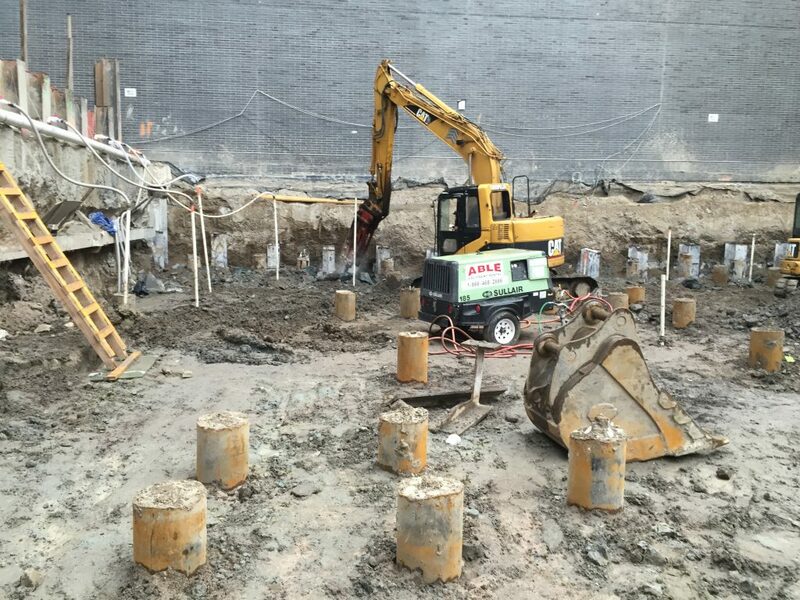 Casing is often used when the sides of the borehole are likely to slough off before concrete is poured. 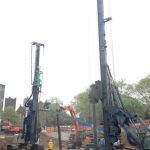 For end-bearing piles, drilling continues until the borehole has extended a sufficient depth (socketing) into a sufficiently strong layer. Depending on site geology, this can be a rock layer, or hardpan, or other dense, strong layers. 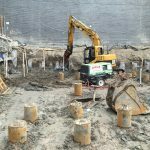 Both the diameter of the pile and the depth of the pile are highly specific to the ground conditions, loading conditions, and nature of the project. 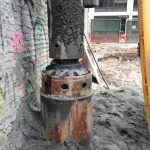 Pile depths may vary substantially across a project if the bearing layer is not level. 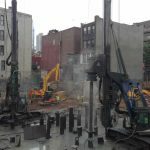 Drilled piles can be tested using a variety of methods to verify the pile integrity during installation.